Disclaimer: These historic county map products are digitized, processed and displayed using standard GIS processing practices including geo-referencing. Although the historic county map sheets sources are geo-referenced, no warranties may be given for exact locations of features represented on the historic maps relative to present features due to the historic nature of the sources and other limitations. Per the disclaimer shown when entering this site, users of the site assume all responsibility in judgement of the use of this feature. Welcome to GNAHRGIS: Georgia's Natural, Archaeological, and Historic Resources GIS. 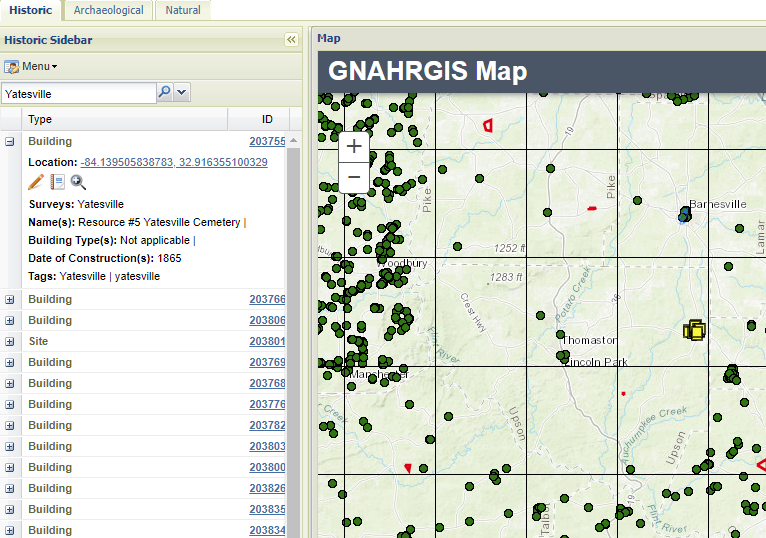 GNAHRGIS is an interactive Web-based registry and geographical information system designed to catalog information about the natural, archaeological, and historic resources of Georgia. GNAHRGIS contains information about Georgia's archaeological, natural and historic resources. In the GNAHRGIS system, "archaeological resources" means archaeological sites recorded in the Georgia Archaeological Site File. "Historic resources" includes buildings, structures, historic sites, landscapes, and districts included in the Historic Preservation Division's Historic Resources Survey or listed in the National Register of Historic Places. This information has been compiled by the Historic Preservation Division of the Department of Natural Resources—Georgia's state historic preservation office—in collaboration with the Georgia Archaeological Site File at the University of Georgia. By using GNAHRGIS, you agree that you have read and understand the disclaimer regarding its use and limitations. Click on a resource to see year, construction, name, and other descriptive items. 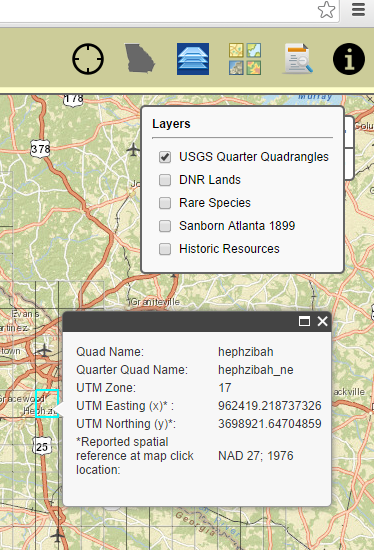 Type in the USGS search name to see exact matches of resources within the USGS Quad. These layers show point features of relative locations of properties with known structures built 40 or more years ago. This document has more information on this utility. GDOT Historic County Maps dating from 1938 have been digitized and processed for search and query based on years and counties. It is a fact of life that field surveys become out of date just as soon as they are completed. Surveyed properties may be altered, moved, or destroyed. Every year a new generation of potentially historic resources (50 years ol d) comes to the forefront. New interpretations of history may supersede those used for previous evaluations of significance. Although GNAHRGIS is based on "live" databases, not all surveys are visible to all users . For example, "restricted" surveys are visible only to the agencies which created them and the Historic Preservation Division until such time as they are classified as "unrestricted." Some recently completed surveys may remain "sequestered" until such time as the Historic Preservation Division is able to review and approve them, and data may change as a result of final editing by the Historic Preservation Division. In order to capture photographic images from older surveys, many original paper survey forms including contact prints have been scanned and incorporated into GNAHRGIS. These survey forms with their 35mm contact prints provide the only available photographic coverage of many surveyed resources. However, the printed data on the scanned survey forms may have been superseded by data in the computerized GNAHRGIS database. In every case, computerized data in the GNAHRGIS database should be relied upon-do not rely on possibly obsolete data printed on the scanned paper survey forms . In any statewide field survey of this magnitude (Georgia is the largest state east of the Mississippi), there are bound to be errors and omissions in the reported data. In particular, with a nascent GIS program on this scale, there are likely to be errors in locational data (i.e., UTM coordinates) for a relatively small percentage of cataloged resources. Errors and omissions should be brought to the attention of the Historic Preservation Division. All things being equal, older field surveys are generally less inclusive (and therefore less reliable) than more recent field surveys. Older, less-inclusive field surveys generally contain up to a few hundred historic resources per county; newer, more-inclusive surveys generally include from several hundred to a thousand or more historic resources. Many of the state's oldest field surveys, predating the mid-1980s, exist only in paper files at the Historic Preservation Division's offices. No information about these surveyed resources is included in the GNAHRGIS system. You will need to visit the Historic Preservation Division's offices to make use of these surveys . Click here for a map and list of such surveys. For information about using paper survey files at the Historic Preservation Division's office or to make an appointment, call the Historic Preservation Division's Survey and Register Specialist at 404-651-5911. Some areas of the state have never been field surveyed for historic resources. No historic resources field survey data for these areas is available in GNAHRGIS. Click here for a map and list of unsurveyed areas of the state. The absence of information about historic resources in any given area does not necessarily mean that there are no historic resources present-it just means that no historic resources have been recorded to date at that location. The only way to know for sure if historic resources exist in any given area at the present time is to go out into the field and check for their presence or absence. Most historic resources in GNAHRGIS unrestricted surveys have been assessed by the Historic Preservation Division for their significance and eligibility in terms of the National Register of Historic Places Criteria for Evaluation. changes in the way the National Register criteria are applied to types of historic resources. Keep in mind that most field-survey evaluations of significance are based on the architectural qualities of the historic resource since little if any historical data is collected during many field surveys. New information about the owners, occupants, users, or builders of a resource or about events, activities, or developments historically associated with it can change its assessment of significance. The accuracy and reliability of field-survey assessments can be roughly gauged by four factors: (1) the date of the historic resource survey; (2) the apparent adequacy of supporting physical and historical documentation; (3) the number, size, and quality of photographic images of the resource; and (4) the current state of knowledge about the type of historic resource. As a general rule, eligibility assessments in newer surveys will be more reliable; eligibility assessments in older surveys may be less reliable . If no assessment of eligibility is reported for a resource, then it should be assumed that the surveyed property likely meets the National Register Criteria for Evaluation and thus should be considered potentially eligible for the National Register unless shown otherwise . IMPORTANT NOTE ABOUT SCANNED SURVEY FORMS IN GNAHRGIS: In order to capture photographic images, many original paper survey forms including contact prints have been scanned and incorporated into GNAHRGIS. These survey forms with their 35mm contact prints provide the only available photographic coverage of many surveyed resources. However, the printed data on the scanned survey forms-particularly the assessments of National Register eligibility-may have been superseded by data in the computerized GNAHRGIS database. In every case, computerized data in the GNAHRGIS database should be relied upon-do not rely on possibly obsolete data printed on the scanned paper survey forms . For Section 106 and Georgia Environmental Policy Act compliance: It may be necessary for applicants and agencies to collect additional or up-to-date field data and historical information to satisfy compliance requirements . "No matches" resulting from a query may mean that no such resources exist in the geographical area of the query. The geographical area on which the query was based has not yet been field surveyed. Therefore no information about historic resources is available. Historic resources matching the query parameters may exist in the geographical area of the query but were not identified in any existing surveys. This may be a fault of the surveys or the surveys may not meet current standards for coverage. Map coordinates for historic resources matching your query parameters may have been inaccurately reported; as a result, the locations of these resources do not show properly. Again, the only way to know for sure if historic resources exist in any given area at the present time is to go out into the field and check for their presence or absence. General users have "read-only" access to all unrestricted surveys including data about surveyed historic properties and their mapped locations. General users also have database and GIS query capabilities for unrestricted surveys. General users cannot create new surveys nor can they add or edit survey data. Registered users have "read-only" access to all unrestricted surveys including data about surveyed historic properties and their mapped locations. Registered uses also have database and GIS query capabilities for unrestricted surveys. Additionally, registered users can create, edit, and query their own restricted surveys. Access to restricted surveys is limited to the agencies which created them and Historic Preservation Division staff who manage GNAHRGIS. Field surveys of historic resources are divided into two major groups: unrestricted and restricted. Unrestricted surveys are accessible to all users-general as well as registered. General users can read and query survey data but cannot add or edit it. Restricted surveys are accessible only to the registered users who created them and to Historic Preservation Division staff who manage GNAHRGIS. Registered users can add or edit data to the surveys they create. Restricted surveys may be added to the unrestricted survey group, but only with the consent of the agency which created them and the approval of the Historic Preservation Division. The editing features of GNAHRGIS have moved to a separate site.